greatly diminished by agriculture. 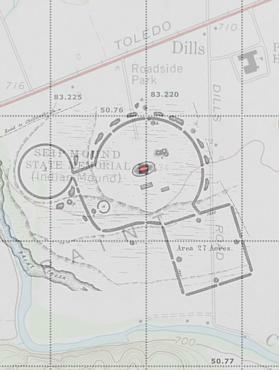 Seip Mound is located near the center of the large circle. 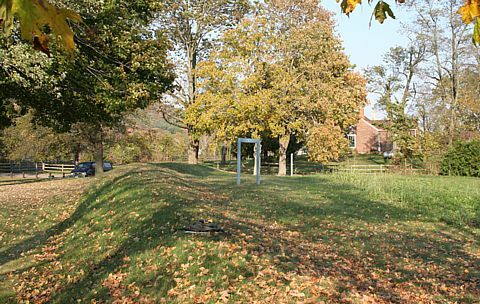 At least 18 mounds are known from within and around the embankments. Placemarks. 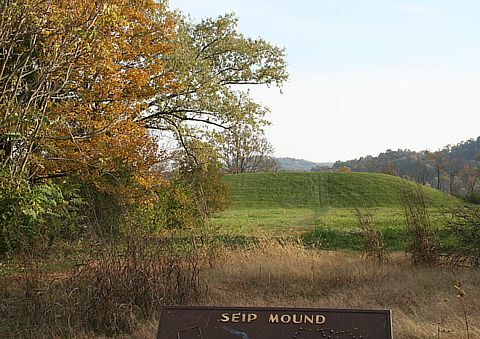 Seip Mound, measuring 250' long, 150' wide and 30' high, is one of the largest mounds in the Middle Ohio River Valley. Excavation of the mound in 1925-1926 revealed 122 buried and cremated human remains. Grave goods included Carolina mica, Isle Royale copper, Tennessee River Valley effigy pipes, and many freshwater pearls. The interpretation plaque displays post mold patterns of several structures excavated in the 1970s. About 10 percent of the original monument is preserved in Seip Mound State Memorial Park, including the best preserved portion of the large circle. This section was once a barnyard, and therefore is not plowed down to the same extent of the remainder of the embankments. 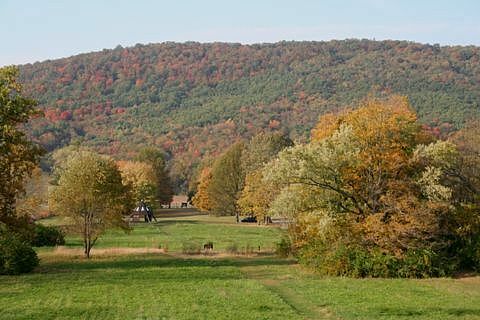 This view of the State Park, looking north from atop Seip Mound, provides a sense of the immense scale of the earthworks. The circle embankment is adjacent to the parked van, and the interpretation plaque is in the foreground along the trail. 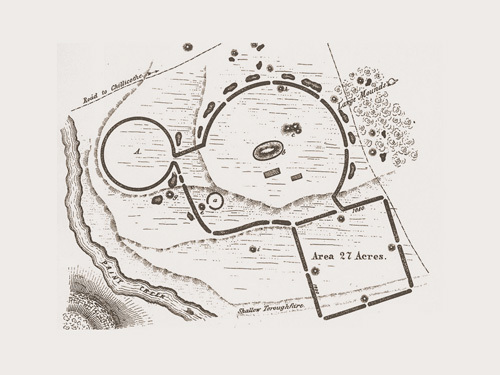 Remains of several large structures were excavated between Seip Mound and the circle, in the area here depicted, near the plaque. 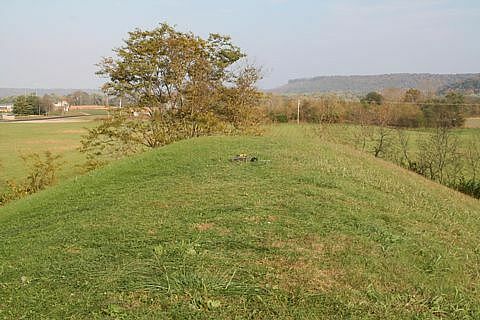 Viewing northwest from atop Seip Mound, the elevated remains of the three adjoining mounds are visible in the field. Far less discernable is the arc of the large circle. 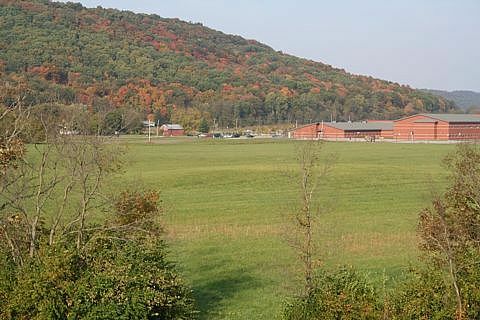 The National Park Service recently acquired the portions of Seip Earthworks not preserved by Seip Mound State Memorial. That area is now a 168 acre unit of Hopewell Culture National Historical Park. The GPS receiver is placed at the center of Seip Mound in this view looking east, downstream in the Paint Creek Valley. Baum Earthworks, now obliterated by farming, was located about six km downstream on the opposite side of Paint Creek. 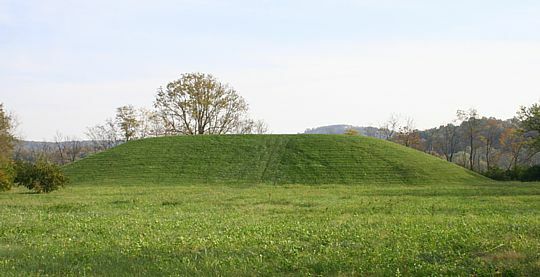 Several other ancient monuments are also located in the valleys west of the Scioto River's concentration of earthworks. 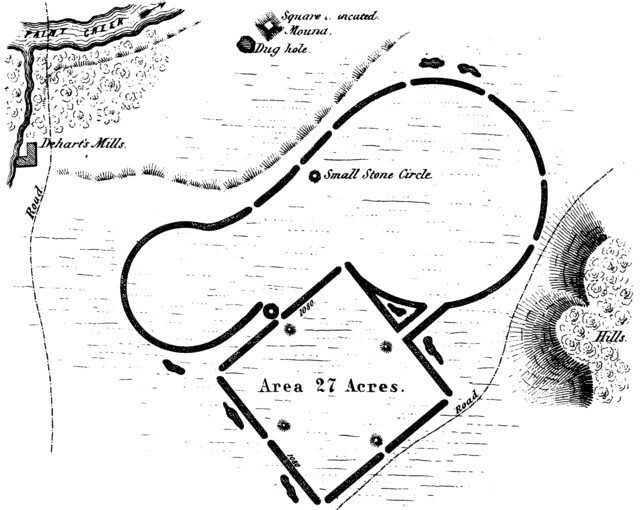 Squier and Davis first drew Seip Earthworks in 1847 to the scale noted in their here cropped artwork, at 1000 ft. to the inch. Subsequent survey by Thomas indicates the earlier drawing requires some rotation. The GPS readings indicated the mound is less near central to the large circle. Thomas also cited a different length for the square side attached to the circle's enclosure, and noted loss of the southmost square wall. The Squier and Davis survey determined the Baum Large Circle diameter at 1,320' (402.3 m, 0.000010 CIR). Thomas reports the Baum Square sides at 1,123' (342.3m) and 1,110.5 (338.5m), slightly greater than the earlier Squier report of 1,080' (329.2m). 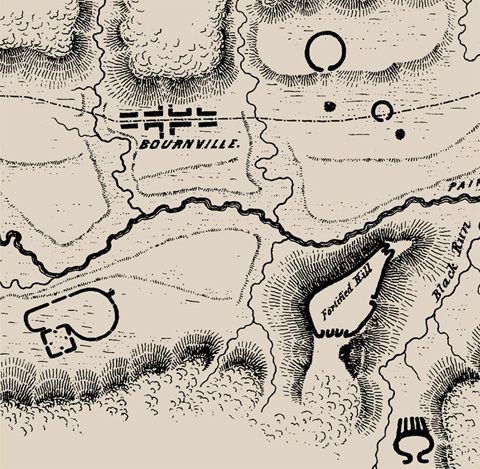 In this partial view of a Squier and Davis illustration, Baum Earthworks is seen in the lower left. The distance from Seip Mound to Baum Square is 0.05355° or about 3.7 miles (5.9 km) ENE. The work in the lower right is a stone monument. The so-called "fortified hill" was a settlement area. 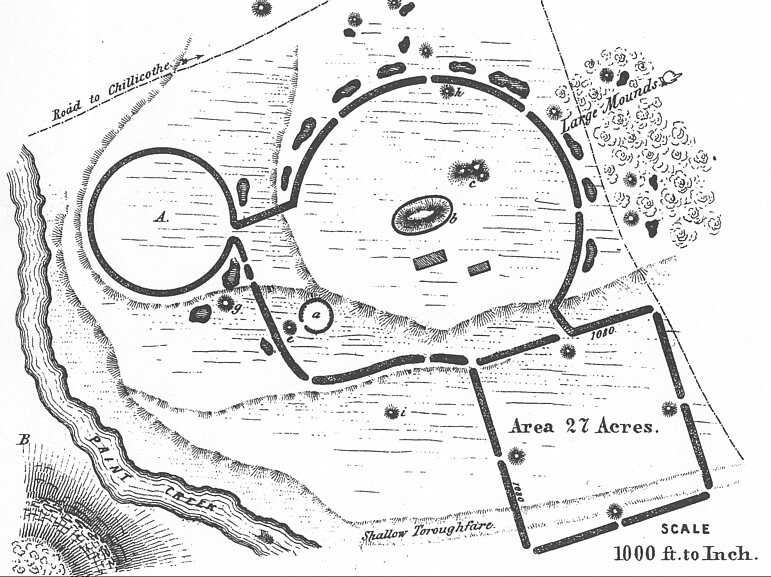 Baum Earthworks and a truncated pyramid mound as depicted by Squier and Davis in 1848. Baby, R. S. and S. M. Langlois 1979 Seip Mound State Memorial: Nonmortuary Aspects of Hopewell. In Hopewell Archaeology: the Chillicothe Conference, D. S. Brose and N. Greber, Kent State University, Ohio. Baldia, Christel and Kathyrn Jakes, Photographic methods to detect colourants in archaeological textiles. The Journal of Archaeological Science, 34:519-525. Mosher, Dave 2007 Forensic Photography Brings Color Back to Ancient Textiles (reporting on Baldia and Jakes). "The materials we examined from Hopewell burial mounds show gradations of color under different light sources. That's significant for ancient textiles because it reveals technologies prehistoric Native peoples were capable of." Squier Ephriam G., and Edwin H. Davis 1848. Ancient Monuments of the Mississippi Valley. Smithsoniam Institution. Thomas, Cyrus 1894 Report on the Mound Explorations.